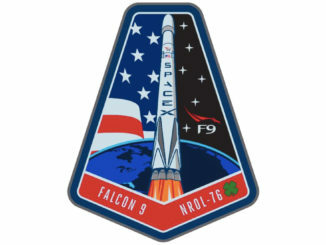 Updated at 11:15 a.m. EDT (1515 GMT) Sunday after successful flight. The test flight also marked a change in public relations for the once-secretive company. It was the first time Blue Origin has webcast once of its launches live. 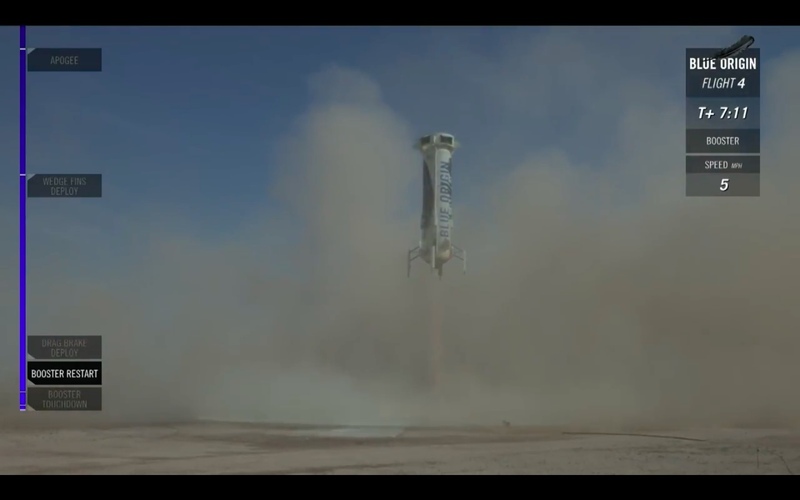 The hydrogen-fueled New Shepard rocket, named for Mercury astronaut Alan Shepard, took off at 10:36 a.m. EDT (1436 GMT; 9:36 a.m. CDT) from Blue Origin’s test site in rural Culberson County, Texas. Generating 110,000 pounds of thrust, the BE-3 engine on the single-stage rocket burned for about 2 minutes, 18 seconds, shutting down after accelerating the rocket to more than 2,000 mph. A few moments later, an unpiloted crew capsule released from the top of the booster, and the vehicles soared to the edge of space. 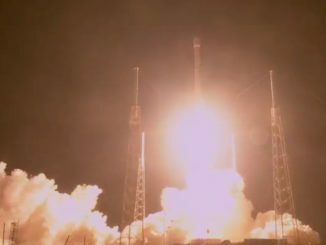 Blue Origin said the rocket reached a peak altitude of 331,504 feet, or about 101 kilometers, about four minutes into the mission. Live video streamed by Blue Origin showed the rocket falling back to Earth at supersonic speed, then deploying an air brake and firing up its BE-3 engine again for a propulsive landing. The BE-3 power plant can throttle down as low as 20,000 pounds of thrust to deftly steer the rocket toward a gentle touchdown. 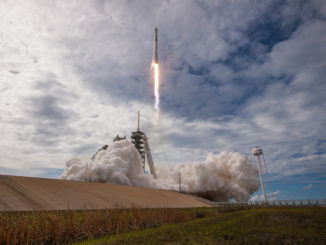 The rocket’s four landing legs extended just before reaching the landing pad, and the booster touched down at 10:44 a.m. EDT (1444 GMT; 9:44 a.m. PDT). One minute later, the crew capsule landed nearby under two main parachutes. The chief purpose of Sunday’s flight was to test the capsule’s ability to safely return to Earth if one of the craft’s three main chutes failed. Downward facing retro-rockets on the capsule were programmed to fire at the last second to cushion the impact. Sunday’s test flight marked the fourth flight of the same New Shepard vehicle, and the sixth flight of the prototype crew capsule. Another change introduced Sunday was an adjustment to the ascending trajectory of the booster to take a more aggressive tilt toward its landing pad to the north. The crew capsule carried three scientific experiments from researchers in the United States and Germany, but the spacecraft will not carry test pilots until some time next year, according to Blue Origin, a company founded in 2000 by Amazon.com’s Jeff Bezos. On Sunday’s flight, the crew capsule will prove its ability to safely land with a parachute failure, the company said. The crew capsule carries three parachutes to touch down near the launch site in Culberson County, Texas. Blue Origin has never provided a live webcast of a test launch before. The company released highly-produced videos of previous flights after they were conducted in secrecy, but Bezos tweeted live updates on the last New Shepard mission in April. The New Shepard system has flown four times in April 2015, November 2015, and in January and April this year. The first flight last year ended with a crash of the rocket on descent, but Blue Origin successfully recovered the suborbital booster after its last three launches. Ariane Cornell, a manager of Blue Origin’s strategy and business development team, said the New Shepard requires “minimal” refurbishment between missions. The turnaround work includes repairs to the thermal protection system, replacement of crushable structures, repacking of parachutes, and software updates to introduce new features as engineers learn lessons about the behavior of the spacecraft. Blue Origin aims to sell New Shepard rides to space tourists, researchers and commercial astronauts, while working on a larger orbital-class rocket to debut by the end of the decade. The company is also working on the 550,000-pound-thrust BE-4 rocket engine as the leading candidate to power the first stage of United Launch Alliance’s future Vulcan launcher.